Can Anyone Replace Ted Kennedy? For four decades, Massachusetts knew who would be representing them in the senior Senate seat for the state. Now that Ted Kennedy has passed away, he’s left a vacancy that has never been filled by another since 1962. Typical in-house arguing about the issue itself could delay the matter of finding a replacement for Ted Kennedy. Some say it just won’t do to fill the seat with an interim replacement too promptly, while others argue that pressing health care legislation must be addressed. Both arguments have merit, but in the having of them it may take longer for a new appointee to find his way to the floor. When an acting Senator dies during a Congressional session, the governor of the state that Senator represented appoints a replacement (example: Frank Capra’s Mr. Smith Goes to Washington). In Massachusetts, state law requires a special election to be held within 160 days of the death so that a new Senator may be appointed. 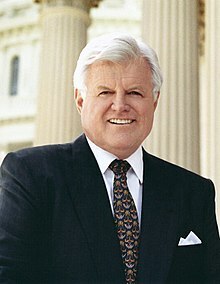 However, Ted Kennedy himself pressed the issue of appointing a temporary replacement until this election may be held. This leaves the door open for many potential replacements, and speculation runs every which way on the possible contenders for the seat. On the Democratic side, Joseph P. Kennedy II, Edward Kennedy Jr., Michael Dukakis, Martha Coakley and Ed Markey have been suggested by press. Republican contenders Scott Brown, Kerry Healey and Andrew Card have also been named as being in the race for the temporary seat. So much of his “The Dream Shall Never Die” speech is relevant now. It makes me sad that so many Americans do not know how much it was really Senator Edward Kennedy that advanced the dreams of his brothers into reality. I put together some of the audio of the speech, accompanied it with images and ideas that highlight some of his accomplishments, and put it into a video. The following page also has information on the six Democratic senators in the Senate Finance Committee who are holding up the Kennedy Health Care act.